In a book that has been raising hackles far and wide, the social critic Thomas Frank skewers one of the most sacred cows of the go-go '90s: the idea that the new free-market economy is good for everyone. 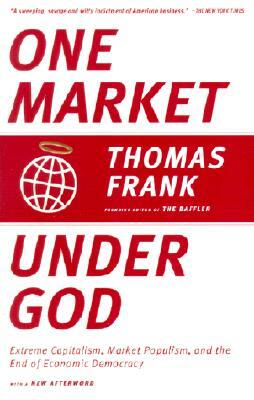 Frank's target is "market populism"--the widely held belief that markets are a more democratic form of organization than democratically elected governments. Refuting the idea that billionaire CEOs are looking out for the interests of the little guy, he argues that "the great euphoria of the late nineties was never as much about the return of good times as it was the giddy triumph of one America over another." Frank is a latter-day Mencken, as readers of his journal The Baffler and his book The Conquest of Cool know. With incisive analysis, passionate advocacy, and razor-sharp wit, he asks where we?re headed-and whether we're going to like it when we get there. Thomas Frank is a founding editor of The Baffler. He lives in Chicago. "A sweeping, savage and witty indictment of American business." "This book will infuriate businesspeople-which is precisely why they should read it."